All the best metaphors and similes to describe a Phillies loss in which they blow an early lead have been exhausted over the course of this dreadful season. At this stage, you can only come out and say it: The Phillies were up 4-0 to start the third inning of tonight’s game. They’d end up down 8-5 by the time the ninth inning was over. It’s an outcome as predictable as the sunset at the end of a long summer’s day (Turns out there was one simile left). Charlie Manuel’s 1,000th win celebration will be delayed for another day, as his squad is not much in the business of winning presently. – They’ve done it all year, so why should tonight have been any different? After putting up some runs early, the Phils shut it down, and the inability to tack on resulted in a loss. – Darin Ruf stayed hot with a two-run homer in the second. The home run would spark a four-run inning for the Phils, with Lee and Jimmy Rollins accounting for the other RBIs. Ruf now has four home runs in the month of August and is posting a .984 OPS. He’s been a bright spot, for sure. The Phils were helped a bit by some sloppy Nats D, but they had done the necessary damage. Unfortunately, they would go cold after that. And that is understating it. – From the third to the seventh inning, the Phils managed only two hits. The Nats bullpen completely shut them down. Tanner Roark, a right-hander appearing for just the second time in his career, pitched particularly well, getting through two innings with just twelve pitches. 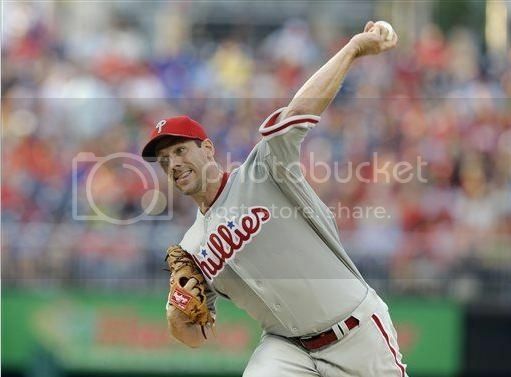 – It’s been a tough start to the second half for Cliff Lee. On top of missing a start due to a stiff neck last week, he’s suffered through a very poor month of July in which he’s posted a 5.92 ERA and allowed eight home runs in just four starts. He would pitch better tonight, but not by much. – After escaping the first three frames unharmed, Lee ran into trouble in the fourth. He’d allow two runs on three hits, two of them for extra bases. Lee did manage to keep the ball in the yard in the inning, something he’s struggled with of late. – He’d get hurt again in the sixth, allowing a two-out run to make it 4-3. Lee would stop the bleeding there, maintaining the slimmest of leads for the bullpen. It wasn’t a terrible start for Lee (a quality start, if you buy into that sort of thing), but it still wasn’t quite what you look for from the ace. He left with his team out in front, but only managed six innings. He struck out six, but walked two and allowed seven hits. Not vintage Cliff. – Jake Diekman and his struggles with command were first out of the ‘pen for the Phils. What happens when a relief pitcher with control issues enters a game? Well, he walks the leadoff man of course. In this instance, the leadoff man would come around to tie the game (not surprisingly), and the Phillies four-run lead had completely disappeared. With one out in the seventh, Diekman was done. Unfortunately, the Nats weren’t. – Zach Miner was next out of the bullpen door, asked to get out of a one-out jam with Jayson Werth at the plate. To that point, Miner had pitched pretty well in limited action, throwing 4.2 hitless innings. That changed on one pitch. Miner’s first offering to Werth was a flat slider, and it was crushed. The bomb gave the Nats a 6-4 lead, and that would be all she wrote for the Phils. There was no way a comeback was happening. Miner allowed two more runs just for good measure. Another day in the books for a bullpen that can’t seem to get anybody out. – He’s young, he’s exciting, and he’s finally living up to the lofty expectations that once surrounded him. Domonic Brown hit his 26th home run of the season in the eighth inning, a solo shot that was the team’s only hit after the fourth inning. It was his second home run since returning from the DL. Guys, get excited about Brown. There’s not a whole lot to watch for at this point, but Brown has been a bright spot. He’s practically a shoo-in for 30 home runs, and is looking like a player to build around for the future. If nothing else, enjoy these last two months of Brown’s coming out campaign. To many more successful years. -The Phillies try to avoid a sweep tomorrow with an awkwardly scheduled 5:05 start time. Kyle Kendrick (10-8, 4.36) goes against Stephen Strasburg (5-9, 3.01). – The Phillies are now 4-16 since the All Star Break. Pass the booze. They’ve lost ten straight on the road.